Why do people fear exams? Answer: Failure to prepare adequately. Cure: systematic study, recite in your own words, summarise, question, review regularly. There's no need to panic. The exam is your chance to showcase your knowledge. Educational apps The University of Western Sydney has compiled a list of useful educational apps, some free, some with minimal cost, to help you with your course work. Explore this site to find an app for your iPhone, iPad or other smart device. Moodle app The Moodle app is a free download. This is the official Moodle app, designed to work together with your Moodle web site. iPhone Apps for College The iPhone can be a student's best friend when it comes to getting through the grueling semseter - after all, it is essentailly a computer in your pocket. 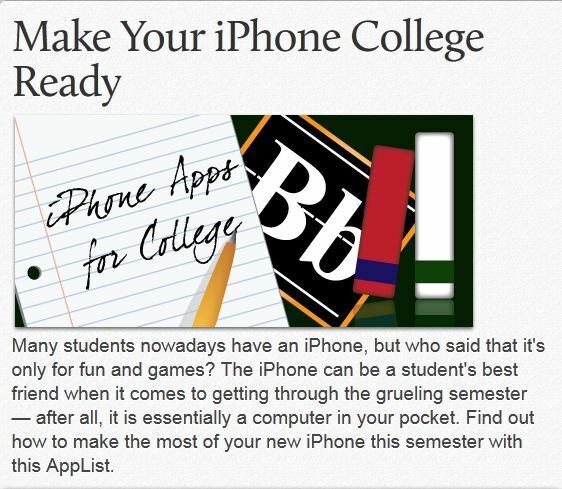 Find out how to make the most of your iPhone with the AppList..
iPad Apps for College If you're planning on taking your iPad to college, then you need to make sure it is college ready. The App Store is full to the brim with great apps that can enhance your academic life. 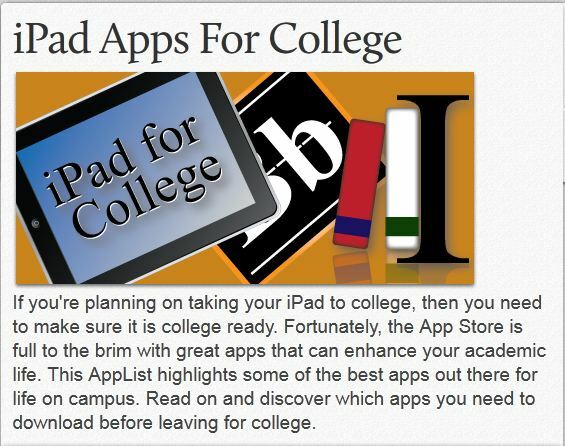 Read on and discover which apps you need to download before leaving for college. Zoho Notebook Use this program to take notes, add audio or video, print or share your notes with others. Create pages and organise your lecture notes. Extra Firefox plug-ins for instant web clipping, or Skype integration for instant chat. This program is versatile and FREE. 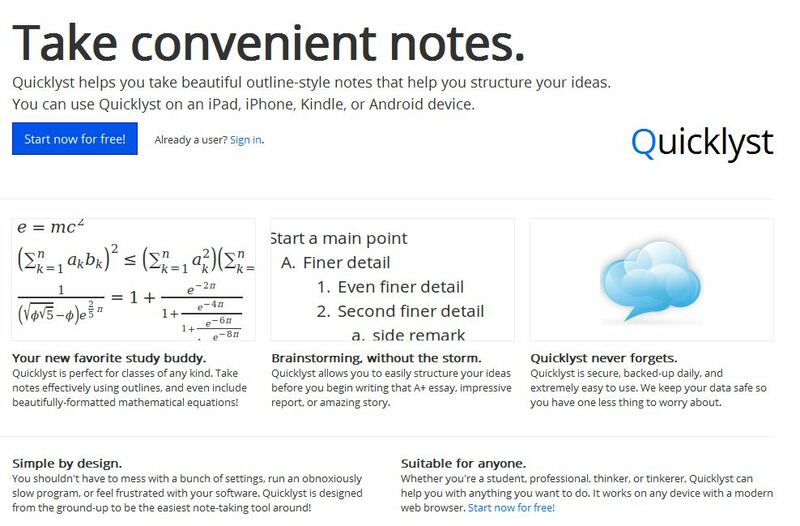 Quicklyst Make taking and studying notes easy with a laptop computer or Amazon Kindle. Quicklyst has some interesting features — it automatically delivers notes to an Amazon Kindle device, looks up topics in Wikipedia, and defines words automatically in the Merriam Webster Dictionary. Quicklyst helps you take beautiful outline-style notes that help you structure your ideas. You can use Quicklyst on an iPad, iPhone, Kindle, or Android device. And it's FREE. 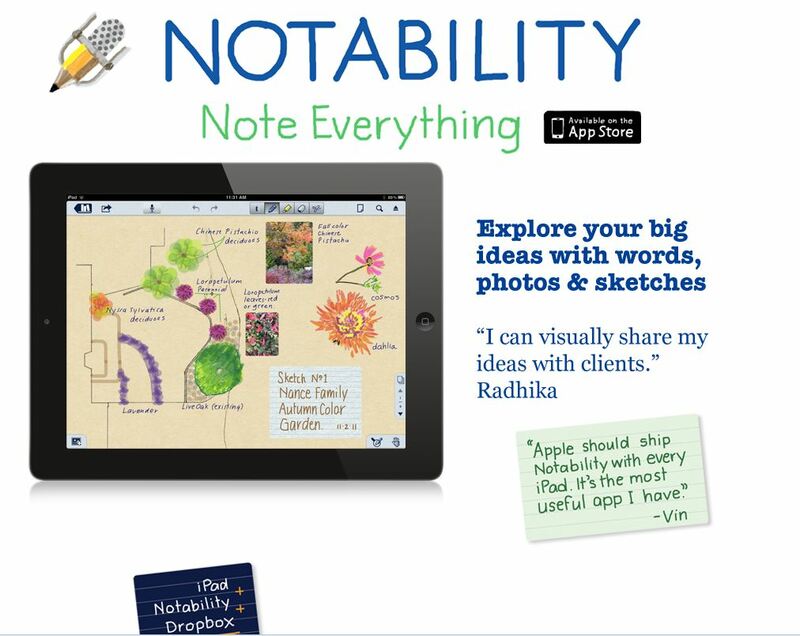 Notability App Take notes and annotate PDFs with Dropbox sync. This app powerfully integrates handwriting, PDF annotation, typing, recording, and organizing so you can take notes your way! Discover the freedom to capture ideas, share insights, and present information in one perfect place on iPad. 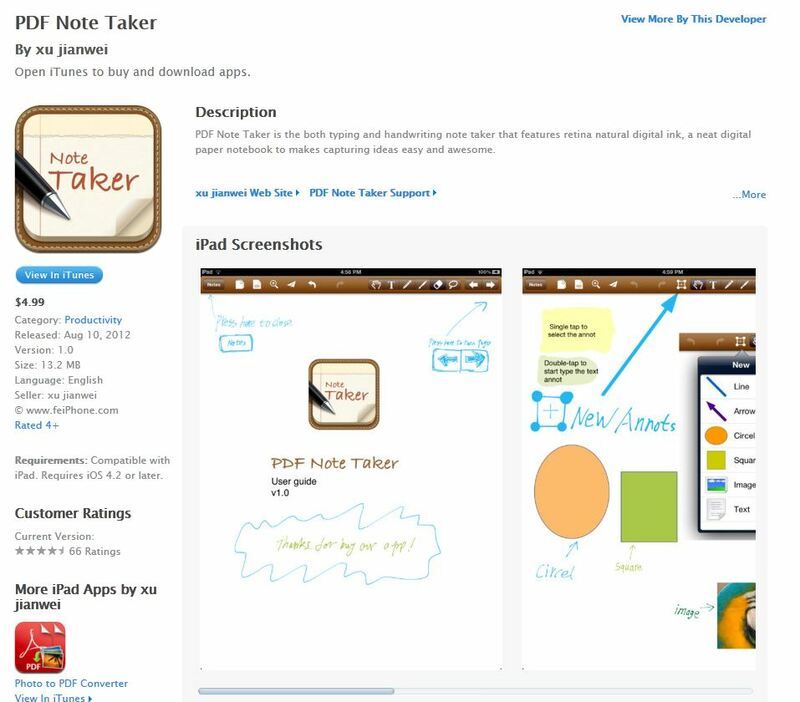 PDF Note Taker PDF Note Taker does both typing and handwriting. Use your finger or stylus to write down your thoughts, capture ideas and information, do school work and draw sketches or diagrams. We included all the tools you might need: pens and highlighters of different colors, images, floating text boxes, shapes and of course an eraser. 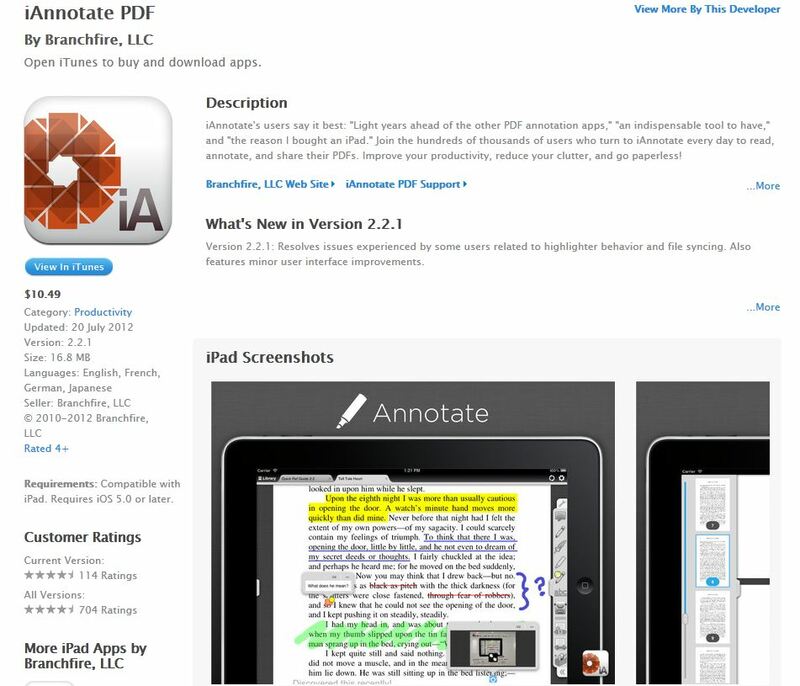 The Note files can be exported as PDF Book files that you can easily view, print and annotate on your computer. Share your notes with anyone by mail and they are able to read and edit them as well. iAnnotate People use iAnnotate for taking notes on lecture slides, annotating important business documents, revising screenplays, grading papers, and much more. Choose from the pen, highlighter, typewriter, stamps, notes, underline, strikethrough, photo, voice recording, and date stamp functions. Sign documents, copy and paste text and follow internal and URL links. Insert blank pages, delete pages, and rotate individual pages or all pages at once. 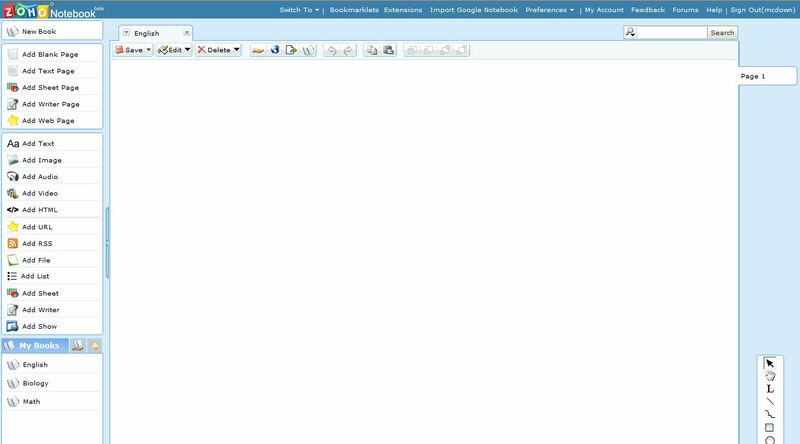 Open multiple document tabs and navigate between them via tabbed reading. Sync with iTunes, DropBox, Box, or WebDAV, or open PDFs directly from email or the Web. 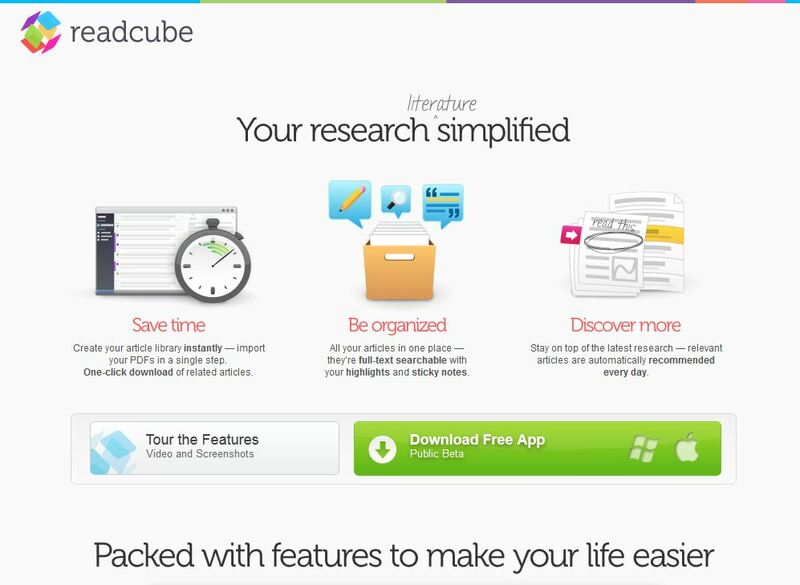 Readcube Create an article library instantly by downloading all your PDFs in one place. Related articles can be added easily and are fully searchable with your highlights and sticky notes. Stay on top of the latest research — relevant articles are automatically recommended every day. 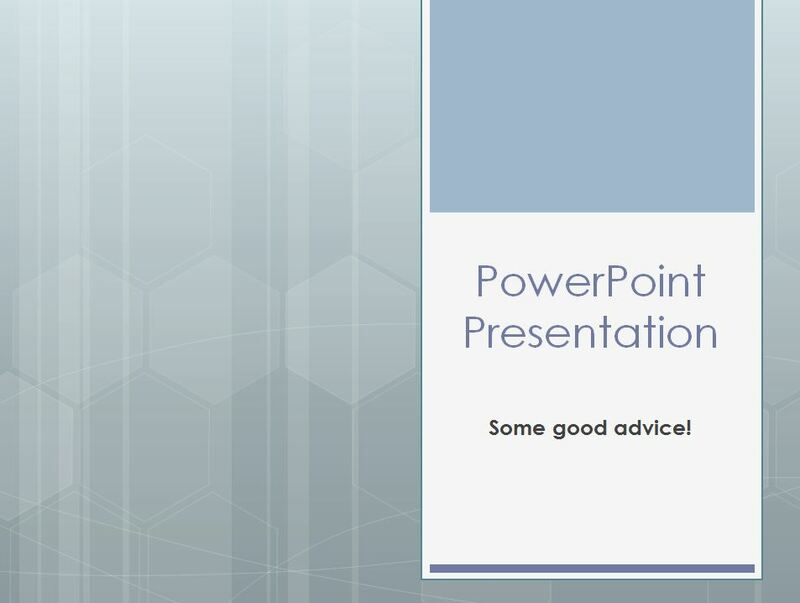 Making great PowerPoint presentations Learn the best tips and tricks to making an awesome PowerPoint presentation. 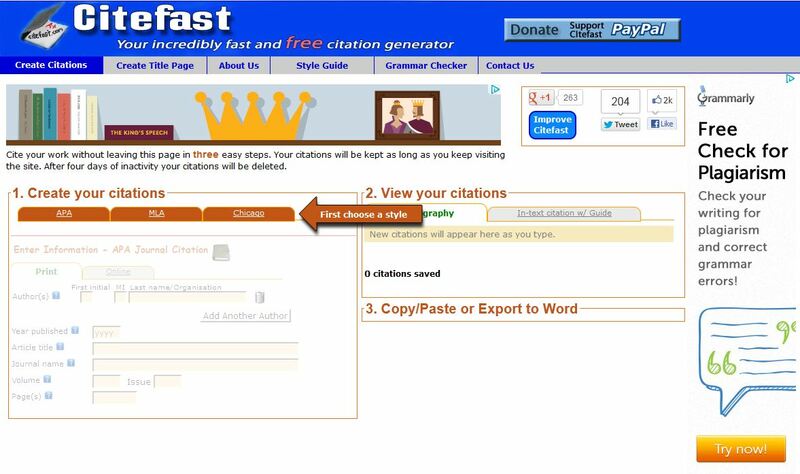 Citefast For quick and easy referencing try using Citefast. But remember: referencing tools sometimes get it wrong. You always need to check the final result and make sure it follows the rules for the style of referencing you’re using. For referencing guides, click here. Study systematically through the semester and review regularly. 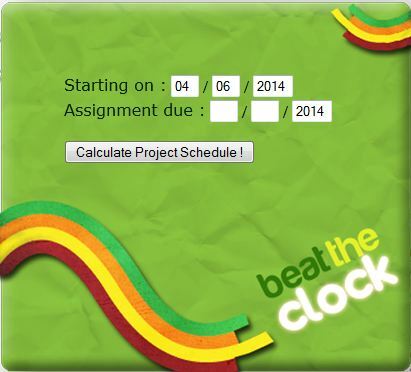 Use time schedules: (1) a semester planner, (2) a weekly timetable and (3) a daily diary or a 'to do' list. Monitor your time use. Attend all classes and appointments. Skipped classes mean work to catch up. Revise lecture notes as soon as possible after a lecture, if only for 5 minutes. Be an active learner. Look for ideas. Ask questions. Listen, read and take notes. Make summaries. Be interested in what you are studying. If you are easily distracted, don't sit with friends in class. Sit near the front. Don't procrastinate. If you have this habit, break it. It only takes 2-3 weeks to establish a new habit. Once study becomes a habit, it's easy to keep going. Study in a regular place, as free as possible from distractions. Get an overview of new reading material by checking the table of contents where possible. Motivate yourself. Reward yourself for tasks completed. Remember, motivation is your responsibility, not the lecturer's. Use peer support. Talking with other students about course work helps build passion for the process. Form a study group with like-minded peers. Talk, think and act like a dedicated student. Believe in yourself. Writing is a skill that's developed through practice. Learn to enjoy writing. Break large tasks down into achievable bits. Find out about exams in advance. The best way is to listen for clues in class. Look at past exams. These are kept in the library. Do your best, but don't be a perfectionist. There are no perfect essays. Visualise success scenarios, including your own graduation. Arrive early and try to sit where you will feel most comfortable. Note all spoken or written instructions carefully. Assume nothing. Read every question and start with the easiest ones first. Budget your time and use the full time. Don't leave an exam room early. Understand the question precisely before you begin writing. Make sure you are answering the question that is being asked. For essay questions, answer the question directly and forcefully in the opening sentence. Don't waste time writing a formal introduction. Don't keep the best till last. Jot down key words to come back to. For multi-choice questions, read all options carefully and use the process of elimination. Always eliminate look-alike options, unless the last one says 'all of the above'. Beware of 100% words (is, isn't, all, none etc). Correct answers are more likely to contain modifiers (often, usually, more, less etc). Use facts and logic, not feelings and impressions. Be concise. Don't waffle. Organise your ideas intelligently. Start with the topic sentence or main claim. Follow this with supporting ideas. Understand lecturer's pet ideas, but don't go overboard agreeing with them! Pray often. There's nothing more powerful than being in close contact with the Genius of the universe. Steve Waugh scored 170 against Sri Lanka in a recent series, and as a result became famous. It is illogical to assume that Steve Waugh's fame is a result of this one innings. 6. Multi-choice. Read instructions carefully. All options might be correct statements. Choose the best one. Use the process of elimination. Try to identify distractors. Strange options are often distractors (irrelevant, foolish, etc). Mid-range numbers are more likely to be right. Eliminate look-alike options (they can't both be right so must be wrong). Note longer, more inclusive options. Jot down ideas before you forget them. Read exam directions carefully. Note any options. Read all the questions. Select the ones you feel best prepared for. Jot cues beside each question. Understand the question with precision. Know exactly what it means. Avoid unsupported opinions. Use convincing evidence and argument. Be concise. Don't waffle or ramble. Write carefully, trying to avoid errors (writing conventions). Be natural and sincere. Avoid high-sounding jargon. Organise intelligently. Write deductive paragraphs with one main idea per paragraph. Understand your lecturer's pet ideas. Don't write an introduction. Get straight to the point. Answer the question directly and forcefully in the first sentence. Don't save the best for last. End with a summarising sentence. Use transition words effectively to tie your argument together. Past exam papers are no longer stored in the LMC library. Exam papers may be available online through Moodle under the units for which you are enrolled but this is at the discretion of the lecturers. Not all faculties provide copies of past exams. Tutoring is available for Lake Macquarie Campus students in the Dyason-Williams Study Room Monday-Thursday during the semester.